In recent years, the U.S. government has ramped up efforts to cut both the foreign and domestic supply of opioids, limiting the number of prescriptions in the United States while providing counternarcotics assistance to countries including Mexico and China. Meanwhile, federal and state officials have attempted to reduce demand by focusing less on punishing drug users and more on treating them. Other countries where opioid use has also spiked, such as Canada and Australia, are experimenting with different policies. What drugs are contributing to the crisis? Opioids, a class of drugs derived from the opium poppy plant, can be divided into two broad categories: legally manufactured medications and illicit narcotics. Opioid medications, including oxycodone, hydrocodone, and morphine, are commonly prescribed to treat pain, while methadone is primarily used in addiction treatment centers to reduce patients’ dependence on opioids. Opioids gained popularity among doctors in the 1990s for treating patients who had undergone surgery or cancer treatment, but in the last fifteen years physicians increasingly prescribed them for chronic conditions, such as back or joint pain, despite concerns about their safety and effectiveness. We didn’t develop an opioid epidemic until there was a huge surplus of opioids, which started with pharmaceutical drugs. Heroin has for decades been the most commonly used illegal opioid. Over the last several years the heroin supply in the United States has soared, and the drug can now be obtained for a third of the price it was in the early 1990s. People in the last few years have increasingly turned to synthetic opioids, such as fentanyl, which is especially lethal. Some law enforcement officials have labeled the drug “manufactured death” because it is cheaper and up to fifty times more potent than heroin. Fentanyl-related deaths are largely caused by the drug’s illegal use, though it can also be prescribed as a painkiller. The Centers for Disease Control and Prevention (CDC) notes that heroin and fentanyl are most often used in combination with other drugs, such as cocaine, or alcohol, which increases the risk of overdose. What is the scale of the epidemic? CFR Editorial. National Institute on Drug Abuse; Centers for Disease Control and Prevention. Many health experts attribute the rising death toll to what they say has been years of overprescribing by physicians. Doctors began prescribing more opioids amid a growing concern that pain was going undertreated, and also because pharmaceutical companies began marketing them more aggressively while claiming they posed little risk. Health-care providers have reported feeling pressure to prescribe opioid medications rather than alternatives, such as physical therapy or acupuncture, because patients request them and other treatments are often more costly or less accessible. Opioid-related deaths have grown in lockstep with the volume of opioids prescribed. A spike in the use of illegal opioids in the United States followed the rise in prescriptions, as many users turn to heroin and other illegal drugs once they can no longer obtain enough of their prescribed drug to keep pace with what may be a developing addiction. “We didn’t develop an opioid epidemic until there was a huge surplus of opioids, which started with pharmaceutical drugs distributed legally,” says New York Special Narcotics Prosecutor Bridget G. Brennan. What are the demographics of the opioid crisis? The vast majority of those who overdose on opioids are non-Hispanic white Americans, who make up close to 80 percent of the annual total. Non-Hispanic black Americans and Hispanic Americans account for about 11 and 8 percent of cases, respectively. Economists Anne Case and Angus Deaton have argued that the rise in what they call “deaths of despair,” which include drug overdoses, particularly among white Americans without college degrees, are primarily the result of wages stagnating over the last four decades and a decline in available jobs. U.S. military veterans, many of whom suffer from chronic pain as a result of their service, account for a disproportionately high number of opioid-related deaths. Veterans are twice as likely as the general population to die from an opioid overdose, according to a study commissioned by the National Institutes of Health. What have been the socioeconomic consequences? The opioid epidemic is having devastating consequences on public health, causing high rates of hepatitis C, HIV, and other diseases, mainly due to shared syringes. Meanwhile, mothers may pass an opioid dependency on to their children if they use while pregnant. Incidences of neonatal abstinence syndrome almost quadrupled from 2000 to 2012. The opioid crisis may also have contributed to an uptick in the number of children in foster care. Opioids have also begun to take a toll on the economy. Testifying before the U.S. Senate in 2017, Janet Yellen, then chair of the Federal Reserve, linked the opioid epidemic to declining labor-force participation among “prime-age workers.” Princeton University economist Alan Krueger says it could account for 20 percent of the decline in participation among men and 25 percent among women from 1999 to 2015. As one example of this, a boiler manufacturing company in Ohio, the state with the second-largest number of opioid-related deaths, reported that at least a quarter of its job applicants failed drug tests. The firm says the workforce shortage costs it roughly $800,000 in orders a year, which end up going to foreign competitors. Where are the heroin and fentanyl coming from? The opioid crisis has also become a national security concern. 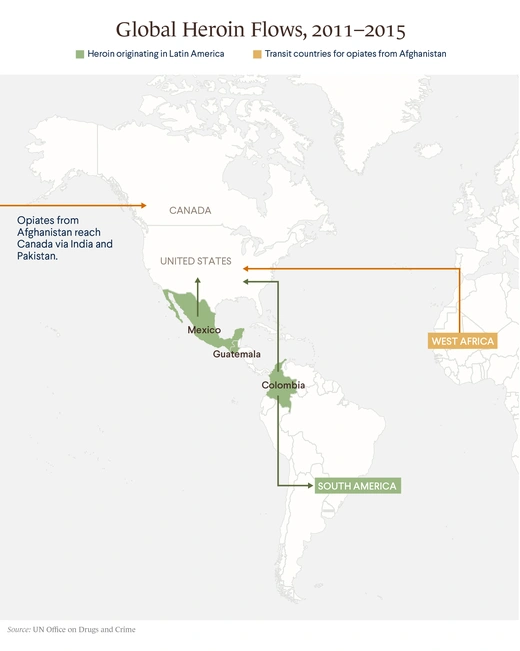 Most of the heroin coming into the United States is cultivated on poppy farms in Mexico, with eight cartels controlling production and operating distribution hubs in major U.S. cities. Mexican cartels, which the U.S. Drug Enforcement Administration (DEA) has called the “greatest criminal drug threat to the United States,” typically smuggle narcotics across the U.S. southwest border in passenger vehicles or tractor trailers. Large quantities of heroin are also produced in South American countries, particularly Colombia, and trafficked to the United States by air and sea. 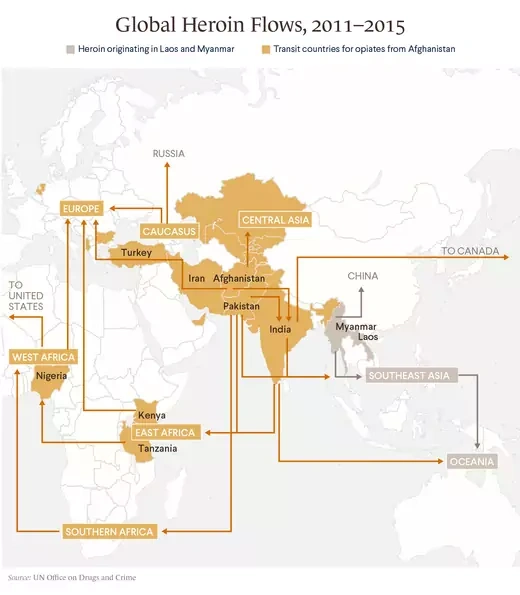 Although most of the world’s heroin comes from Afghanistan, only a small portion of the U.S. supply is produced there. Most fentanyl coming to the United States is produced in China, U.S. officials say, and commonly transited through Mexico. Chinese authorities “have struggled to adequately regulate thousands of chemical and pharmaceutical facilities operating legally and illegally in the country,” says a 2017 report [PDF] issued by a congressionally mandated commission. What has the United States done to restrict foreign narcotics? Over the past decade, the United States has provided Mexico with nearly $3 billion in counternarcotics aid, including for police and judicial reforms, in a program known as the Merida Initiative. The initiative, which U.S. officials say led to the capture of some top cartel leaders, including Joaquin “El Chapo” Guzman, has continued under the administration of President Donald J. Trump, though funding has declined in recent years. Through a similar partnership with Colombia, the United States has provided almost $10 billion since 2000; it effectively drew to a close following the end to civil conflict there in 2016. The DEA, the leading U.S. agency involved in counternarcotics, has also coordinated efforts with China, which has designated more than one hundred synthetic drugs as controlled substances. China banned production of four fentanyl variations in 2017, although some analysts fear these moves will only spur clandestine labs to create new alternatives. In a 2018 meeting with President Trump, Chinese President Xi Jinping pledged to restrict all fentanyl-like substances, a move Trump hailed as a “game changer,” though Beijing has yet to implement it. Recent U.S. administrations have also increased the number of border patrol agents to approximately twenty thousand. Heroin seizures and trafficking arrests more than doubled [PDF] between 2007 and 2017, many near the southwestern border. In his first weeks in office, President Trump issued executive orders directing the construction of a southern border wall and additional increases to the number of border patrol agents. Some analysts say a wall would do little to curb drug flows, however, as most illicit drugs are smuggled through ports of entry. What are some efforts to restrict domestic supply? Federal agencies, state governments, insurance providers, and physicians all influence the supply of opioid medications. Federal regulators have introduced new limits on opioid prescriptions, reducing the total nationwide by 25 percent from their 2010 peak to 2017, according to the CDC. The agency issued guidelines in March 2016 advising physicians not to prescribe opioids as a first-line therapy. The DEA reduced production quotas for pharmaceutical manufacturers by at least 25 percent that year for opioids categorized as Schedule II drugs, or those that are currently accepted for medical use but carry high risk of misuse; these include oxycodone, fentanyl, and morphine. The agency has since proposed additional cuts, in line with a call by Trump to reduce the number of filled prescriptions by one-third in three years. Reporting by the Washington Post and 60 Minutes, however, found that a law passed in 2016 after heavy lobbying by pharmaceutical companies has effectively stripped the DEA of its ability to freeze suspicious shipments of narcotics. A December 2018 congressional report on painkiller shipments to West Virginia found that lack of oversight by the DEA fueled the black market and worsened the epidemic in the state. In 2018, the Justice Department ramped up efforts to prosecute those involved in overprescribing and trafficking. In April it partnered with nearly all state attorneys general to share opioid prescription information in order to investigate drug crimes, and in its largest-ever move to crack down on health-care fraud, it brought charges against more than 150 doctors, nurses, pharmacists, and others for their alleged roles in distributing opioids. Additionally, lawmakers in more than fifteen states have passed or considered legislation limiting opioid prescriptions since the start of 2016. States including Mississippi, New Jersey, Ohio, and Oklahoma, as well as dozens of cities, are suing pharmaceutical companies, alleging they overstated the benefits of prescription opioids and concealed the risks. What is the United States doing to reduce demand? Previous federal antidrug campaigns relied on incarceration to deter drug use and trafficking. This approach has been widely criticized for failing to keep people from cycling in and out of prison and for disproportionately targeting African Americans. In recent years, federal and state officials have shifted toward prevention and treatment. President Barack Obama reduced prison sentences for hundreds of nonviolent drug offenders during his tenure. However, he failed to secure legislation that would have eliminated mandatory minimum sentences for federal drug crimes. His administration also established hundreds of new drug courts, which proponents say are an effective alternative to incarceration. Drug courts, the first of which was launched in 1989, under the George H.W. Bush administration, provide nonviolent offenders an alternative to the criminal-justice system that involves monitoring and rehabilitation services rather than prison time. In recent years, federal and state officials have shifted toward prevention and treatment. In 2016, President Obama signed legislation authorizing more than $1 billion in funding, largely in the form of state grants, to expand opioid treatment and prevention programs, as well as make the drug naloxone, which can counteract opioid overdoses in emergencies, more readily available. Some city and local governments have launched what are known as harm-reduction programs, which focus on limiting virus transmission and overdoses through the promotion of safer drug use. Critics of such programs argue that decriminalization would lead to higher rates of drug use. In October 2017, President Trump declared the epidemic a public health emergency, freeing up some federal grant funds for states to direct toward the crisis and loosening restrictions on access to treatment. Meanwhile, a presidential commission recommended other policies [PDF] to combat the crisis. A year later, Trump signed into law the Support for Patients and Communities Act, bipartisan legislation aimed at further expanding access to addiction treatment and increasing research on alternative pain medications, among other things. However, some observers say it does not provide enough sustained funding to curb the crisis. 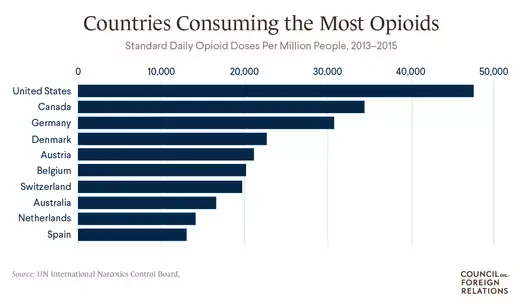 How are other countries dealing with opioid addiction? The Netherlands. The Netherlands permits the sale and use of small amounts of cannabis to steer users away from so-called hard drugs [PDF], such as cocaine and heroin, and has implemented harm-reduction policies. 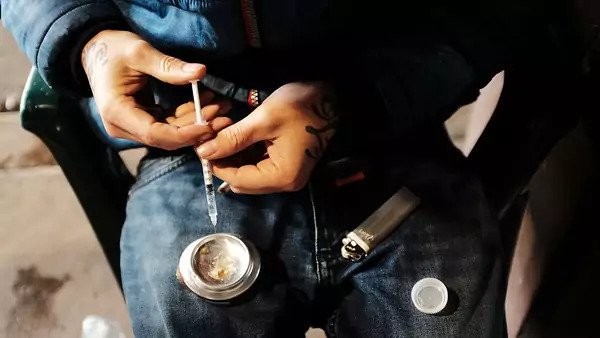 In the 1990s the country began offering heroin at no cost, and the rate of high-risk or so-called problem use was halved from 2002 to some fourteen thousand in 2012, according to the European Monitoring Centre for Drugs and Drug Addiction, which estimates the decline has since continued. Proponents of decriminalization point to the Netherlands for evidence that these policies work, though critics claim they have not curbed organized crime. Canada. Amid a growing opioid crisis of its own, Canada has authorized the opening of supervised consumption sites and partnered with China to curb fentanyl flows into the country. British Columbia and Alberta, two of Canada’s most populous provinces, declared a public health emergency and crisis, respectively, boosting funding for addiction treatment and increasing access to naloxone. Opioid-related deaths in the country are still on the rise, however, with the death toll reaching nearly four thousand in 2017, a 33 percent increase from a year earlier. In mid-2018, the health ministry announced it would seek to restrict most marketing and advertising for opioids. Australia. Heroin use in Australia declined following an abrupt shortage of the drug in 2000, but the country has seen a sharp increase in the use of prescription opioids, now the cause of more than two-thirds of opioid-related deaths there. In 2012, the health ministry announced it would launch a nationwide electronic system already being used in Tasmania to monitor opioid prescriptions, but it has not yet been rolled out. In January 2018, the government enacted a ban on over-the-counter painkillers containing codeine. Laurie Garrett urges the Trump administration to target pharmaceutical companies in Foreign Policy. The Guardian maps the spread of opioid overdose deaths in the United States. Margaret Talbot looks at opioid use in West Virginia, the state with the most deaths from overdoses, for the New Yorker.